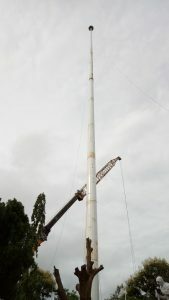 A large number of people, who thronged the Gandhi Mandap located at Sarania hilltop in Guwahati to be witness of hoisting the national tri-colour of 120×80 ft dimension at a height of 300 ft on the 72nd Independence Day celebration, were hugely disappointed on Wednesday morning. 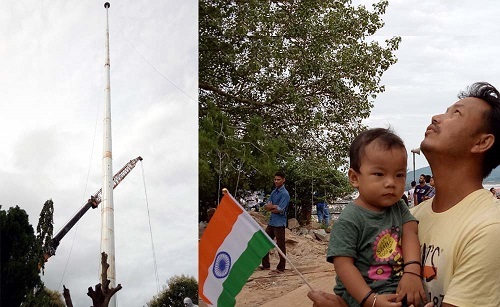 No national flag was hoisted on the third tallest flagpole in India on the auspicious occasion. Interestingly many politicians who had earlier boasted and posted on various social media about the tricolour to be hoisted on the third tallest flagpole in the country on I-Day, removed their posts from their social media account. Children wearing costumes of tri-colour design holding balloons of saffron, white and green colours returned from Gandhi Mandap without a smile on their faces. Locals alleged that the concerned authority did not work sincerely for which people missed the spectacular view on the Independence Day. Hazarika also questioned on the sincerity of the officials and workers as well as the Government. As per information on Wednesday, the date of inauguration of the pole is not decided by the authority. Northeast Now, though tried to contact Guwahati Smart City Limited officials and GMDA officials for the information on the date to inaugurate the flagpole, did not receive any response. The Guwahati Smart City Limited (GSCL) authority informed earlier that the Department of Industry and Commerce, Assam financed the budget of Rs 2.91 crore for construction of the flagpole in Guwahati. The Tata Consulting Engineers Limited has been carrying out the project under the Guwahati Smart City Limited. An officer on special duty (OSD), GSCL, informed that high strength steel has been used in the pole. The OSD also said that the pole would be an attraction for tourists. The Aircraft Warning Lights (high intensity devices that are used as collision avoidance measures) have also been used in the pole.